What is the difference between a “lead” and a “referral”? A lead is a contact that may come from any number of sources. This contact is generally not expecting your call. For example, if someone gave an insurance agent a list of people who just bought new homes - that might be considered a good set of "leads". Unfortunately, because the prospects are not expecting a call from the agent, it’s basically not much better than a cold-call. However, a "referral" is the opportunity to do business with someone in the market to buy your product or service and who’s been told about you by a mutual friend or associate. In other words, they know who you are and what you do when you contact them. Once a referral source has given you the name of a person to call, it’s up to you to do the rest. A referral is better than a lead because you can use the name of the referral source to open the door. What more could you hope for? Actually, there is quite a bit more you can expect from referral sources that have been properly developed. There are many different “shades of referrals”. According to material developed by the Certified Networker program there are at least sixteen shades or levels of a referral. The shades of a referral vary in quality according to how much involvement your referral source has invested in preparing the referral for you. The more time and effort your referral source puts into qualifying, educating, and encouraging the prospect before you become involved, the higher the quality the referral should be. Conversely, if your referral source only passes a prospect’s name to you, most of the work of developing that prospect into a customer falls on you, and the likelihood of turning that prospect into a customer diminishes significantly. Of course, the effectiveness of your referral network in providing you with quality referrals depends on the amount of work you do to develop the sources in your network. There are many ways to encourage your referral sources to become active and enthusiastic members of your marketing team. 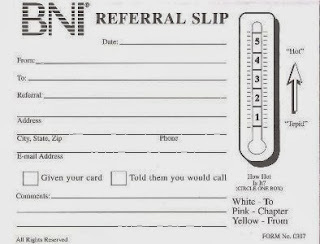 These efforts determine the shade of the referrals you will receive over time. The shades of a referral can range from merely receiving the name of a prospect to obtaining a referral that is a customer waiting to make a purchase. Here are three examples that are fairly representative of the broad range of potential referrals that you can develop with your referral sources over time. Once a referral source has authorized you to use his or her name, you can feel fairly certain that you have established a good level of credibility with them. By allowing you to say that he or she endorses your product or service, your source has given you valuable leverage with the prospects that know them; however, the problem with this shade of referral is that the work of developing the prospect still rests with you. Once you have conveyed that your mutual contact recommends you and your business, the task of selling really begins. Your referral source moves beyond the role of a promoter to that of a facilitator. He or she takes the responsibility of working out the details of getting you and the prospect together so you may discuss the business opportunity further. The sale is closed before you contact the prospect. On the strength of your referral source’s efforts, nothing else is required from you except to deliver the product or service and collect the payment. This is the strongest of all referral shades and is indicative of a networker who has cultivated a strong relationship with his referral source. 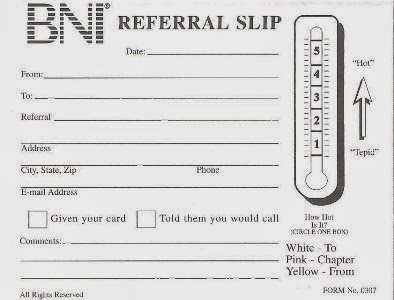 A referral is almost always better than a lead. But don’t forget that there are many “shades” of a referral and the development of those shades depends on the development of the relationships that you nurture. The key in developing long-term referrals rests with the relationships you develop. The information, support, and referrals that you assemble will be based on your relationships with the other individuals and businesses that you know.